The Project The Future of Living Materials is coming to an end. But ArtEZ Future Makers is already thinking about a possible follow up research project. This project on sustainable, innovative materials has been getting a lot of attention in the media the past few weeks. CLICKnl, the knowledge and innovation agenda of the creative industry, has conducted a number of interviews to show the breadth of research and design in the creative industry, and how this contributes to social issues. They also interviewed Danielle Bruggeman about the Model Sector and specifically about the project ‘The Future of Living Materials’ from the Artez Center of Expertise Future Makers. The Future of living Materials in ‘Het Financiële Dagblad’. You can read the article here. 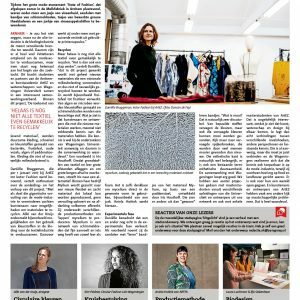 Living Colour, part of The Future of Living Materials is mentioned in an article in the online magazine Our World on sustainable fashion at the Dutch Design Week 2018. You can read the article here. The Future of Living Materials in ‘De Arnhemse Koerier’. You can read the article below.